Looking up in the tower of Southeast Light. Taken by Malcolm Greenaway with a "fish eye" lens. I love this photo and I highly recommend that you go to his Gallery on Water Street (right near the theater) to see it because it's pretty good here but it is incredible in person. I want to tell you about a good thing. Malcolm Greenaway wrote an article for the Block Island Summer Times, demonstrating the use of a “fish eye” lens. He took some pictures of the interior of the Southeast Light and put them in the article. And he also, by way of illustration, took a picture of the interior of the Spring Street Gallery. Malcolm could have taken a picture of his own gallery, but he took a picture of ours and put that in the article. Malcolm was looking for a room with ceiling beams so that he could show how the fish eye lens bent them toward a circle, and that was foremost in his mind. But it also shows a generosity of spirit that comes out in other ways. He and his wife Nancy come to most of our shows and openings and often support the work of new artists. Malcolm sends me articles and links that he thinks will helpful. He shows me his equipment and tells me how he does things. He calls and tells me when he’s seen a good bird, a snowy owl in particular. Here is the interior of the Spring Street Gallery. My work can be seen in miniature, around the front door, but what you can really see is the rug. That's my rug. And, just to give you an idea of how a fish eye lens works, that odd little shape at the bottom of the picture is the bottom of Malcolm's legs and the top of his feet. I can tell you, because his workshop is up above our Gallery, how hard he works all the time. His attention to every step of the process is amazing. I would have to say that if there is a picture in his Gallery, you can know that to the best of his or anyone’s human ability, it is absolutely perfect. I love many things about photography but one of the things I love the most is my circle of photography friends. They are serious about photography, crazy about it in fact, and all quite gifted in what they do. And everybody’s work is so different. It is fascinating actually, to observe all the ways of seeing the world as demonstrated through their eyes. You can find Malcolm’s article in the most recent Block Island Summer Times. You can check out Malcolm’s website here: malcolmgreenaway.com/gallery.html . His pictures of the Southeast Light and of course, many others are available at his Gallery on Water Street, right near the Theater, here on Block Island. 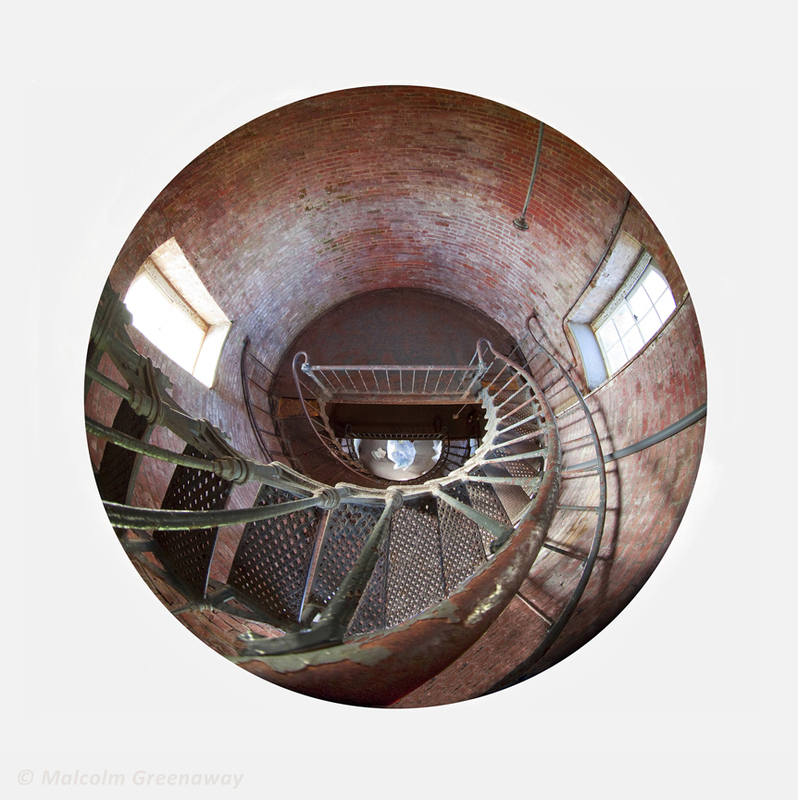 Here is Malcolm's picture of the tower at the Southeast Light, looking down. PS. I’m back on the island and all is well. I’m starting to work through all my pictures from the year because my show will be coming up in September. It's been raining but it's beautiful again today. There is a tropical storm coming up the coast so maybe there will be waves.